Practica is the term used to indicate a practice, where dancers can investigate movements without the pressure of a formal milonga setting. Often there is a teacher guiding the practica. 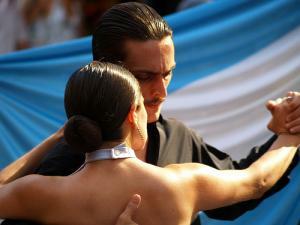 Milonguero Style is the traditional style of tango where the couple is locked in a close embrace, with torsos joined so that their balance is shared. The basis of estilo milonguero is the walk, with improvised small movements and emphasis on connection and the music, which is always traditional. This style of tango came out of the necessity to dance in compact spaces, such as the crowded milonga floor. Salon Style has a more upright posture, with dancers maintaining their own axis. The embrace can be close or open, loosening to provide the woman with less restriction when doing pivots or adornments. The steps are usually improvised but often there is choreography. Nuevo Style is more open and elastic with changes of direction, lots of turns, and more experimentation on the part of both dancers. Sometimes there is an exchange of lead and follow. With each dancer in his and her own axis, improvisational or choreographed phrases are wide open to personal expression and expertise. Dancers who favor this style tend to be young (under 40) and enjoy dancing to electronic and non-traditional music. Tanda — a set of tangos, usually 3-4, played at a milonga. Cortina — the undanceable music played between tandas in order to clear the floor. Cabaceo — the manner in which people are invited to dance; slight nods between potential partners from across the room. Codigos — the unwritten rules of how to behave in a milonga. This page rendered in 0.071 seconds.